Only 13 days to go! 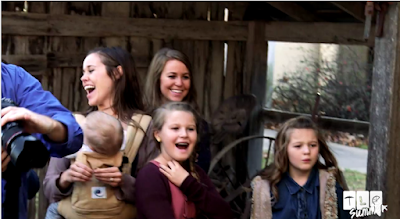 The Duggars return to TLC with new episodes of Counting On Monday, July 30th, at 9pm ET/8pm CT. We posted a sneak peek several days ago, and below is an additional one. HAHAHAHA. Josiah and Lauren got married. It's a total surprise, so don't tell anyone. They are married, and probably already pregnant! Double surprise we also get to see Joe and Kendra get married again lol...this will be like the 10th showing. Lol courtships marriage and babies is all we see anymore. There is no link or picture below. You have to laugh they are so far behind, two babies are born, one is about to be, the spoiler alert is already married and there will probably be another courtship, wedding and numerous babies all before the new season ends and the next (if there is one) begins! They show the entire season in "sneak peeks" so why bother to watch? Well I haven’t seen the details of any of that. To me it’s like getting caught up every few months. Like I may know what happened to my friend, but it’s only when we get to visit that I get all the details. It’s actually nice. This show has been “catching us up” every little season. NEVER have I “already seen” those details before the season is released. By your reasoning, nobody should want to see a play by Shakespeare because we already know the plot. By your reasoning I shouldn’t read the Bible because I already know what it says. By your reasoning I shouldn’t look at family pictures because I’ve seen them already. That’s bananas. Anon @ 12:41 I thought the same, talk about setting the bar low lol! So does this mean, if you plan to see a new movie coming out and while at home watching tv, a sneek peek of that movie comes on, it pretty much shows all the good parts of the movie, you don't go see it? I wouldn't go see a movie if they put the entire thing online first, weeks before it came out. That's what TLC has done with these wedding and birth "specials" before the new season. They put all the good stuff they had out there already, not in peeks but in full 20-30 minute videos. Spoiler alert? No, its really old news. TLC is really exploiting the pregnancy news. So disappointing. Is that Jenni who always looks so miserable? Poor kid. Poor Jenni? She looks ecstatic in the picture. Some kids are just more reserved. She looks happy in this picture....but I must agree she doesn't smile much. Then again, I have four kids and one doesn't smile too much....just her nature. Jenni has her mouth open. Jordyn has mouth closed... i believe. I think she's really sensitive in a family where everyone is busy with activities and it's assumed you're having a good time in the group, whether you are or not. Seems like Jenni needs more patience and understanding from her parents, and more close nurturing. How old was she when the Jubilee & Josie problems happened? That probably didn't help, if she was still emotionally very young herself. It would have been scary for a little one to process, and she may have become timid because of it. I hope she grows out of it, but she's got a lot of growing up yet to do. Jenni has ALWAYS been quiet person since she was a new born, Jenni is loved, she is just conservative in her way, she is one I have like since when she was born, (yes, I have watched the show that long), Jenni U are a great girl, U can be anyway U want, 😄👍 TAKE CARE!!!!!!!! Jordyn is about to say "Wow" in this picture. Yay only 13 days to go. Counting On is not going to show the younger kids doing school. They're not the focus. TLC removed Josh so his family isn't really seen. Derick decided that for his family, it was best to part ways with TLC so the Dillards aren't on anymore. We are still interested in their weddings, births, etc. BUT we already know who -what- when -where - and why. How nice it would be to hear of something with this family we did not already know during an actual episode. Will not be the same w/o Jill and her little family. I really enjoyed them. TLC needs to quit with the contrived suspense and surprise. Viewers do read and are quite able to discern what has happened; what is happening; and what is going to happen. TLC, just be honest and let us sit back and enjoy. Seriously! I hope we get so see more of Josiah and Lauren. From the pictures and videos I’ve seen so far, they don’t seem as connected or in love as the other couples. I have to say from what I have seen Lauren appears more into Josiah than he is towards her, even in the little video at their wedding he looked less than thrilled on what should have been the happiest day of his life to date! It almost looks like an arrainged marriage. Hopefully time will tell. I don't know, she seems very much in love. Maybe I'll see it more from him when I watch the wedding. He showed little emotion. She seemed truly in love but not sure about Siah yet?!?! Joe and Kendra’s wedding was almost 10 Months before Josiah and Lauren’s wedding , not six. I have seen joe and kendras wedding so much I could recite it ugh... Well there went my exitement out the door. Back to replaying the past. They've already released the footage of Josiah & Lauren's wedding, so why bother airing it on TV? And we saw Gideon being born, and we've seen Joe's wedding many times! This show & this family doesn't seem to know what they're doing any more. They seem absolutely desperate for ratings, so they'll try anything to get one more viewer. Actually per the "sneak peek" wedding episode, Josiah and Lauren started to get close DURING the wedding planning for Joe and Kendra. (I also recall a lot of Duggars including Josiah himself hinting during one of the Joe/Kendra wedding episodes that he'd be next to court.) Lauren stated they'd really had a relationship going on for about 9 months before the wedding, so that would mean it started in October 2017. So while there is a 3 month gap between the J/K wedding and the J/L courtship becoming official, there really isn't that much of a gap between "Joe and Kendra's honeymoon" and "Lauren and Josiah get to know each other as more than casual childhood friends". And while we've certainly seen enough of the Joe/Kendra wedding, we haven't seen any footage of their honeymoon, and they smartly kept her pregnancy a low-key event outside the TLC show itself. So while the news is old, the video footage won't be. Can't wait for the new season. Yay! why do you even want to see all this again? We already know what happened. This show has wore out its welcome. I will not be watching. I want be watching either. Time to just do speciala maybe once a yr. I like suspense not watching gender reveals when the baby has already been born and I despise the boring wedding planning. It looks to me like this new season was timed to announce the birth of Jinger’s baby. Isn’t she due right about now? I suspect it is also timed to announce John Davids engagement. People are upset because the new episodes are old news. They have to realize that not everyone follows the Duggar's lives daily to see what has transpired. Most people just turn on TCL and enjoy a good, wholesome show. Everything is new to them. Thank you to Anonymous at 8:02 AM. You are echoing my thoughts exactly and I agree with you. If people are upset that what is seen on TV is what has already been read about on the blog, then don't read the blog. I am one that does not have cable TV and I am not able to watch the show. I appreciate hearing all these details. As was stated above, most people just turn on to TLC to watch the show. I wish they'd show footage other than just weddings and births. I liked it when I heard from Jessa & her family & saw her children & the same with Jill's. I'd prefer to see their family lives.